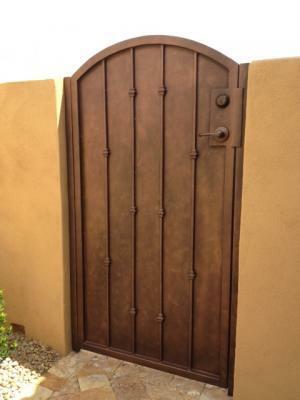 Check out our recent Iron Gate install in Glendale Arizona. It has a bronze finish to match the Tuscan style home. We hand forge all our iron work and can provide matching designs for different pieces of your home. Our technicians use a epoxy paint so you won't have to worry about touching up your door or gates. Signature Iron Doors are secure and timeless. Call now and set up at time to visit our showroom and find out your iron gate options!